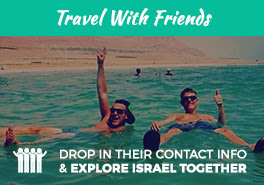 Embrace convenience & fly from Chicago on this incredible Birthright Israel experience! Travel with other college students who have the same appreciation for brunch hotspots, local sports, happy hours, & experiencing all that your city has to offer. Gain the perspective of the locals while exploring the unbelievable culture, scenes, sites, food, & people of Israel while making incredible connections on this immersive, unforgettable adventure through Israel with Israelis for all 10 days! This Birthright Israel trip is perfect for any college student from the area & are run in partnership with JUF, so don't miss your chance. "Shorashim gave me an Israel experience that went above my expectations. There is something unique about the relationship we were able to develop with Israeli peers that I do not think other trips are able to offer. I found the trip to be both stimulating and fun, and I gained a stronger connection to Israel as an American Jew."